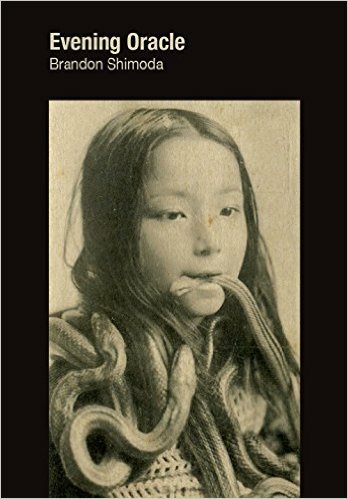 The cover of Brandon Shimoda’s Evening Oracle — a shimmery, porously-bordered book which recently won the Poetry Society of America’s William Carlos Williams Award — is a young Japanese girl with three snakes draping her shoulders. She is holding one in her mouth too, gently, her teeth cupping its neck not crushing its head. Her eyes are soft, the right a little lazy or else the camera makes it look that way. The girl is either dressed or bound in a cloth somewhere between rope and lace, and her hair might be greasy. She is an entertainer, the citation tells us, “The World’s Greatest Bear Girl,” and it’s important to note that the picture is not scary at all, unless we ask ourselves where the bear is. The snakes seem manageable. Her eyebrows are relaxed. And he’s not alone. While the reader never doubts Shimoda’s light up ahead (or behind, or sideways) on the trail, we listen too to his friends and family in letters to and from him. There are excerpts here from walks and other kinds of correspondence with Etel Adnan, Mary Ruefle, Brenda Iijima, Don Mee Choi, Phil Cordelli, and especially the poet Dot Devota, in addition to signs, languages, colors, and tastes from Shimoda’s travels across Japan. Presumably these treasures are linked in geography and time. Other connections, smartly, aren’t forced but come to the surface naturally — plants and breath and fruits, and food other people prepared lovingly, and most especially the mortality of parents still living and long gone. Shimoda I think maps this last territory especially accurately. How do we find family — how do we know family — we’ve only met in stories and genetics? How are we part of a lineage when we are writers, traveling without biological children but holding deep love anyway? Rob Schlegel writes, to Shimoda and we overhear them, if “you think we’ll all turn round when we die, like grapefruit, to be dipped into the sea’s radiant glow . . . ” I love how “round” echoes: in the shape of citrus, in looking over your shoulder to check direction or for company, in the repetition of sound. Evening Oracle as a whole does this too, and is best read in chorus with Shimoda’s earlier O Bon, also designed by HR Hegnauer; Prince Niu’s poem “An elegy on the death of Prince Iwata,” where this book gets its name; Dot Devota’s poems; whatever grief you the reader carry; and perhaps too Williams’s Paterson, as an early map that Shimoda soon and elegantly took offroad. I loved this book and am excited to read it a third time soon, then again and again. Mairead Case is a working writer in Colorado, where she is a doctoral student at the University of Denver, Coordinator at the Naropa Summer Writing Program, and a poetry teacher at the women’s jail. She is the author of the novel See You In the Morning (featherproof) and the poetry chapbook Tenderness (Meekling Press).